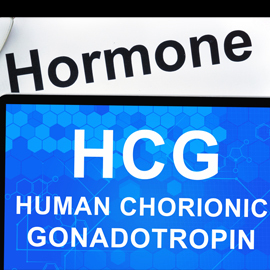 HCG stands for Human Chorionic Gonadotropin Hormone. This is a Hormone released from a woman’s ovaries during her entire 42 weeks of pregnancy. This is one of the signals used by her body to prevent her from getting pregnant again by a constant release of progesterone. It also functions as test for certain tumors. It is a powerful hormone and an excellent tumor marker. So why is it offered for weight loss? Why do we inject this into woman and tell them they will lose weight? This is a puzzling question not only to me, but also the many other physicians in the American Society of Bariatric Physicians. ASBP is the leading society in this nation who has credentialed this nations top Weight Management Specialists. Our annual and semi-annual meetings are aimed for further enhancement of our scientific knowledge in this field. I am proud to report to you that science has not shown any benefit from the use of HCG in the field of weight management. In fact, there are many scientific papers published in medical journals, which conclude that Placebo injections are equal or even better than HCG injections when it comes to weight loss. In fact many of the reputable Bariatric physicians across the nation who still abide by the Hippocratic oath which states “do no harm” absolutely refuse to offer HCG injections as a part of weight loss measure to their patients because of the concerning side affect profile of this hormone. According to my studies, research, interviews of my colleagues, and solid experience in the field of Bariatric Medicine. I join many colleagues across the nation in educating the public against the use of this hormone, which causes harm to your future. Of course as patients, it is easy to believe our doctor when he promotes this lucrative Injection. But I encourage you to do your own research about anything any doctor or practitioner promotes. Ultimately, the trust and reputation of your doctor will be of absolute importance. In my practice, I don’t use HCG simply because of the fact that I do care about the safety and the future of my patients. This is why I have taken extra time in researching and formulating 3 different injection mixtures that contain a strategic blend of valuable vitamins and amino acids that have key roles in enhancing metabolism, and concentrate in fat burning, along with producing natural energy extracted from your food breakdown. These solutions all have the core ingredients of the infamous Lipotropic Injections. The Metabo-lipotropic and the Slimtropic injections are far more superior as they fine-tune the biochemical wheel of fat burning metabolism to a higher degree of efficiency.